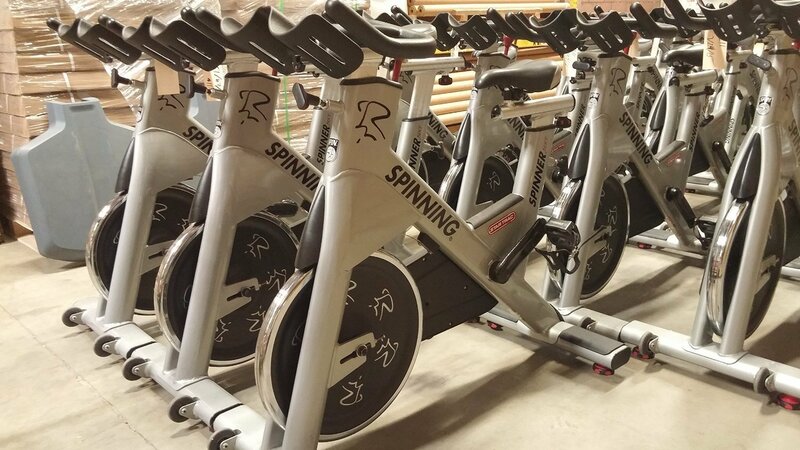 The Spinner® Spinner NXT spin bike is a sleek and user-focused workout machine, accessible for novices and experts alike. Composed of a steel frame and dip coated in zinc for rust prevention, the bike, sold for $1,395 on Amazon.com (at time of review), features a capable drive system for a unique riding experience. Adjustable handlebar and seat settings and over-molded leveling feet make this spinner extremely customizable. Riders from 4’10’’ to 6’10’’ feel comfortable getting a workout on this machine, and elbow rests, strategically located between the handlebars, allow riders to hunker down and power through the workout. Additionally, individuals can control the workout with NXT’s control resistance knob, with a one motion emergency stop feature. Everything about this model screams user-focused accessibility. Customizable Spin Settings: Whether the rider is on the short or tall side of the height spectrum, this bike can accommodate that person. Micro-adjustable fore and aft seat slider and handlebars, and dual-sided SPD compatible platform pedals, make this product customizable to any person’s personal biking needs. Elbow Rests: When you grow tired of holding the handlebars, there are convenient elbow rests you can use to lean forward and push on. Design: While a smooth ride is one of the most important features of any spinning bike, the look also weighs into many people’s decision-making process. The Spinner NXT delivers on both fronts. The sleek silver design features black and red accents. It weighs 133 pounds and is 21’’ wide, 54’’ long and 40’’ tall. Rust-resistant Features: Working up a sweat is one of the main points of spinning, so the zinc dip coating for rust prevention is an important feature for this bike. Without it, the spinner could rust and deteriorate after a few years. A Smooth Spin: Even though a person is riding indoors, he or she may still want to feel as though they are out on the open road. The powerful chair drive system provides that authentic feel that most indoor riders yearn for in a bike. The ergonomic saddle, with double-density padding, also makes this bike feel custom-made for each individual rider. No Electronics: While the NXT has many positive features, it is lacking in some areas. The bike does not have an electronic console that some of its competitors have these days. One such example is the 2013 Proform Tour de France Centennial. A 7-inch touch screen display was added to the 2013 bike, which uses iFit Live technology to simulate a road course. Other spinners, such as the Keiser M3 with Computer, have an electronic system that tracks heart rate, calories burned and distance biked. The Spinner NXT does not have either of the above-mentioned options. Weight Issues: Although the bike allows for riders up to 350 pounds, the narrow-width handle bars could be considered uncomfortable, especially if the person has wide shoulders. Buying an additional dowel may be necessary to work-out comfortably on this machine. And for smaller riders, the machine’s weight might be a bit much. The 140-pound size could be hard to move, especially on carpeted floors. While there are many pros and cons to this particular bike, the overall review of the Spinner® NXT is a favorable one. The additional size allowance gives this bike a wider audience than other similarly priced options, such as the Scwinn A.C. Sport (on Amazon for $1,249) with a 300-pound capacity). And while larger riders may need to purchase an additional piece of equipment to make it more comfortable, they can do so for a minimal investment. Another missing feature that shouldn’t be a deal breaker is the lack of the heart-rate monitor. Spinning computers can be purchased separately from the bike and added no problem, or the user can buy a Digifit Connect iPhone accessory as well. All-in-all, the Spinner® NXT is a well-rounded bike with minimal issues, and based on other online reviews as well, this bike is a clear winner among other spinners in this price range.